So you’re getting ready to close the deal. The profit looks great, the buyer checks out, and he wants the car. The buyer then asks if you would accept a credit card. 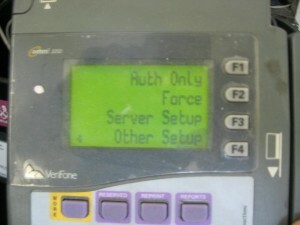 No problem you reply, your credit card processing machine is ready to go. The buyer remarks that there is just one thing you need to do. You will need to “force” the approval and call the merchant to get an approval code. Wait a second you think, that sounds a little fishy. Everything is fine your customer explains. It’s just because XYZ happened and this is the way that his credit card company told him to do it because of XYZ. Go ahead call my credit card company at this number, he explains, you’ll get the approval code I’m talking about. You proceed to call the number and give the merchant the credit card number and the person on the other end replies that the process is fine, albeit unconventional, providing the approval code you need. So you proceed, following the process your customer guides you through, swiping the card, navigating thru the options, and holding the “Force” option to get an approval. The charge goes through and everything seems fine. You get an approval and print out the receipt. Wow, this person knows more about credit card machines than you do, you think to yourself. You shake hands and the customer drives off in his brand new car. A few days later you check your account to make sure the transaction posted, but to your chagrin, it hasn’t. You call your bank and explain the story. But unfortunately, you have been had. There is no money in your account. You call the customer, no answer. You call your insurance company who regrets to inform you that they don’t offer coverage on Force approvals. Now you call the police. Hopefully you have Lojack installed on that vehicle. Moral of the story? Never do a force entry. If you have to do it for some odd reason, get an approval from your merchant, not the buyers.